Transitional - Single Sink Vanities There are many different bathroom vanity sets available. Which one suits your style? Simply put, vanity styles can be simplified into three different categories: modern, traditional and transitional. Modern bathroom vanities are sleeker and a contain straighter lines. There are lot of different innovative features that can be placed into the modern vanity category. Traditional vanities are usually curvier and commonly have a distinct rustic brown finish. Transitional vanities are a mixture of the two and are a trending style. You can also spice up your vanity styles with innovative and functional features such as soft-closing doors and vessel sinks. 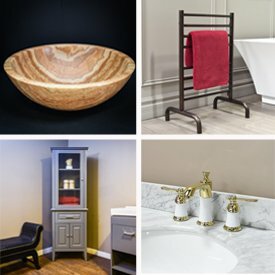 Find your dream bathroom today. At Luxury Living Direct we offer a variety of different vanity styles to fit your desired decor. Call (800) 574-3022 if you are ordering 2 or more vanities and see if you can get a special discount!